Bead Soup Blog Party is here! The third reveal. Kudos to my resilient partner and Bead Soup Blog Party hostess, Lori Anderson. I don’t know how she managed to survive organizing over 540 of us, with three different reveal dates, and a host of unanticipated medical issues. Lori, you’re seriously amazing! The Bead Soup Blog Party (BSBP) happens only once a year. By signing up in January, all participants agreed to have Lori pair us with another jewelry designer; to have the partners exchange a quality package of beads; to make one or more pieces of jewelry with those beads adding in whatever we needed or wanted from our own stash; to use both the focal piece and the clasp we were sent; and to post our creations on the assigned reveal date. I’ve been experimenting a little with fold forming, so I knew I wanted to fold some silver sheet, enhance it, and find a way to attach it to the ceramic piece. I drilled three holes in the ceramic. (Yes, it made me very nervous! But I thought, “hey, I’m used to drilling rocks and glass, so I should be able to drill this too…”) I folded, hammered and stamped the silver piece. I soldered two lengths of 16 gauge wire to the back of the silver piece to use as rivets. Before riveting the piece on place, I punched 4 holes in it so I could attach 2 short strands of beads. A nod to necklace I didn’t make. I pushed the wires through the holes in the ceramic, and coiled them to finish the back of the rivet. I did not take the time to engineer a pin catch with rivets. (That would have been a great plan, and I wish I had done it.) Instead I had a plastic pin back, that I covered with the sari silk that was part of my soup. It’s held in place with a chemical bond. (That’s the fancy way of saying epoxy.) The last little bit on the back, that looks like a belly button, is a purple rubber washer with a bead inside. It covers the third hole I never used. 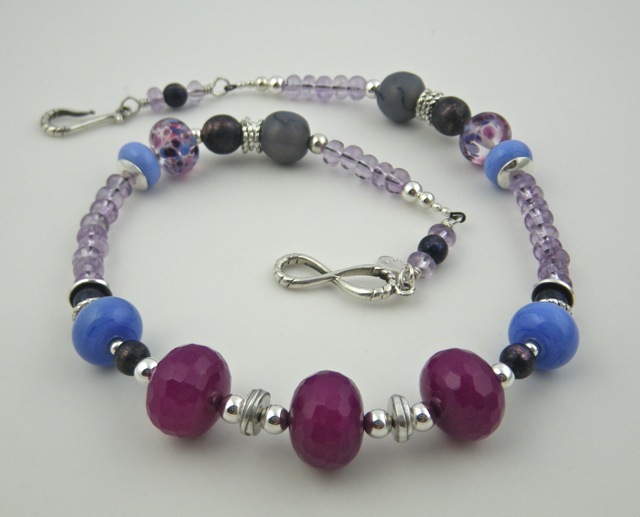 I wish these photos did a better job in showing the pretty periwinkle color of the glass beads that Lori made herself. I knew right away I wanted to use them with the dyed jade beads (center of necklace) she sent. The darker beads are actually patina-ted copper in a purplish blue. The smaller light beads are amethyst. I was so sure I would be making an asymmetrical necklace with my soup. Surprise. I must have needed symmetry when I put this together! The jade beads below really challenged me too. I liked the potential of the two holes, and had a lot of ideas for them, none of which panned out. I kept trying to mix the color with complimentary colors, getting out the color wheel, trying all manner of combinations. I ended up having better luck bringing out their greener side. Even with the pearls and chain, the holes looked out of proportion with the finer wire until I added the green leather. I spent much more time with these than I thought I would, but I really enjoyed the challenge and the result. Lori’s own lampwork beads (above) and the silver shell beads from Bali (below) were my most favorite parts of the soup she sent. I love the ease and comfort of an elastic bracelet. I haven’t taken this one off since I made it. It looks great next to my watch and I get to admire the silver shells and smile whenever I check the time! Thanks Lori. This bead soup party has been such a fun experience, and I learned a lot. That’s my reveal, but there is SO much more to see. You simply must start with my partner, Lori Anderson, the Bead Soup hostess herself! Then continue to hop through as many of the participants in the list below as you would like. Just click on the link next to their name. I love it all, Barb but I’ll have to say that the brooch is especially ingenious! Thanks Susan. Looks like you were up late last night too! Love the brooch. Very creative! You did great-so many beautiful creations. I love the brooch-what a creative way to use that focal. Nice job. Love that brooch and the earrings with the leather are super cool! Nice Job. Love that brooch and the earrings with the leather are super cool. 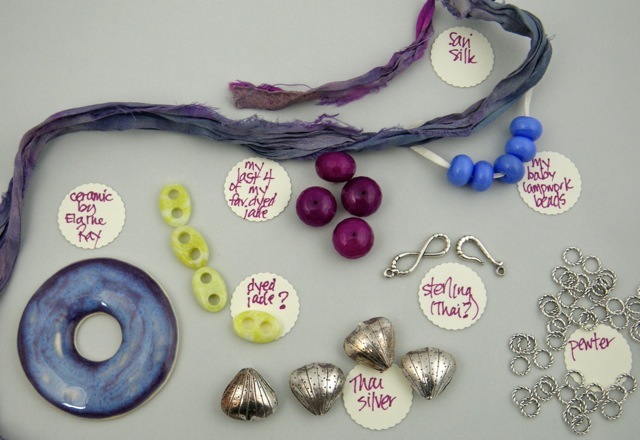 very inventive projects, especially green earrings!congrats! Love that brooch, very inventive! and I love also all the other pieces you’ve made. Would certainly wear any of them! WOW, Barb – that brooch is totally amazing! I love all your other pieces too and that bracelet is fantastic! What an amazing job you did! You made so many fabulous pieces from your soup!!! Great Job!! I’m not the brooch-type. But this is amazing! So nice! And the other pieces too. i love your brooch…such a creative avenue. now those green earrings are what is making me drool! so pretty and screaming of spring! Very creative! i love the necklace the most. Wow, that brooch is such a great use of that focal! Beautiful designs! Beautiful work and great use of the materials! Great designs! Love the broach! I love your creativity and inventiveness…you had wonderful ingredients, and you did them justice! I can’t believe you drilled the ceramic piece! That’s amazing it didn’t break. It looks amazing as a brooch. Very artsy piece. The other pieces are great as well. I really love the bracelet. Thanks Lisa. I supported the ceramic piece on a flat bed of hot glue, in a pyrex dish. Then I filled the dish with water to cover the piece and drilled slowly with a diamond drill bit. I was nervous, but it went very smoothly. OMG. You are truly amazing. Making a brooch was an incredible idea, idea but then to drill holes (you’re my hero, way braver than I am), AND to make that beautiful fold formed piece…..incredibly impressed. You need to show Elaine Ray because I’ll bet she’ll flip at the beauty. I’m so glad I passed along that hoarded piece because I would have never done it justice regardless of how much I loved it. The necklace is sweet …. I still can’t find any more of that purple jade so I love how you showcased it. The EARRINGS….woah. Imagination? I love love love your style. And the bracelet is one I’d wear a lot, too. Love the beads you paired the silver with. Thinking back, I really hope I didn’t disappoint you … it seems I sent all my partners chunky beads but I loved them myself…And you guys were so very generous with me in more ways than one. I truly loved working with your soup and appreciate everything so much! I was blown away with the pieces you made with the beads I sent to you. I love all of your beautiful creations and it’s hard to pick a favorite but if pushed I’d say the brooch is a winner! Oh, and the earrings. Oh , and the bracelet. Oh, and the necklace. You have wonderful style and amazing talent. I will be watching you for more in the future!!! Thank you for sharing your creations. You did your soup proud. 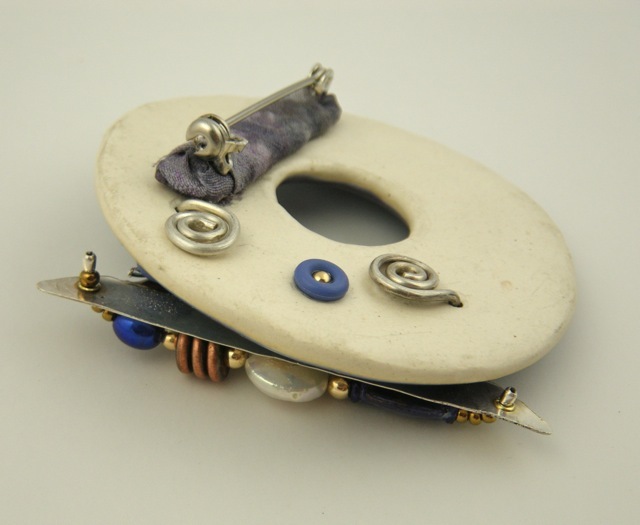 Love your approach to using the focal as a brooch. Very keeping with the theme of the bead soup. And I love your green earrings. I absolutely love those earrings! So creative! Super pretty! Really like your creations. Those little lemon colored earrings are awesome. Barbara your pieces are stunning. The brooch is awesome and the green earrings I love. You have a wonderful design sense. It’s hard to pick a favourite but it’s a toss-up between the brooch and your bracelet. I love the process you took to get to the brooch. All your jewelry pieces are just gorgeous and well executed but this brooch is just extraordinary. The combination of materials and the design, make of this a truly piece of art. I just love it, love it, love it. I am so happy I found your blog through the BSBP. Lovely pieces…all of them. I just can’t take my eyes off from the yellow jade earrings. All your pieces are wonderful – but that brooch is jaw-dropping! Each piece is fab, really! I thought the brooch was my favourite – I find it to very sci-fi-ish; I can see it being worn on a space station somewhere – but then I saw your pair of blue earrings and fell in love with its quiet simplicity. And then I laid eyes on your shell bracelet. I can completely understand why it hasn’t come off your wrist. Beautiful work all around! I love the green earrings and great work with the brooch, I love your metal work! Great designs! 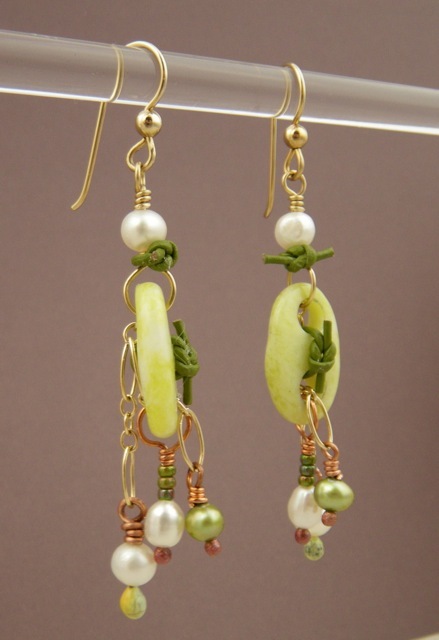 I love the swingy, springy yellow jade earrings! Everything is lovely here, but of course the brooch is getting most of my attention and drooling!!! Beautiful pieces, the broach is especially lovely! Oh, my, that brooch….. THAT BROOCH!!!! It’s so amazing and I am so impressed. I am first impressed by the fact that you DRILLED IT!!!! What courage. But, it is also just absolutely gorgeous. I would so wear that. You really nailed this one, girl. Great job! Wow Barb – love love love that Brooch! Love that last pair of earrings! Wow, Barb! Your brooch is a statement-making piece, with such an elegant vibe! Really, really love it. And the addition of the green leather to those earrings, just the perfect touch! Wow, what a chance you took when you drilled that bead–and it really paid off. That brooch is awesome! I wants! I wants! I wants! ohhhhhhh, my Presciousessssss. the brooch is so creative…! i love how you added on that little silver piece that makes it so much more eye-catching! i can see how the shell bracelet is an everyday wear… it’s such an easy match for almost any outfit.. but i must say my absolute favourite are the green jade earrings… i’m just so in love with that pair..! Oh, Barbara – you are a brave, brave woman! And it paid off big time! I love the fold-forming you included – it enhances Elaine Ray’s gorgeous focal perfectly (and the seed bead nod to the necklace that never was – brilliant in my opinion!). 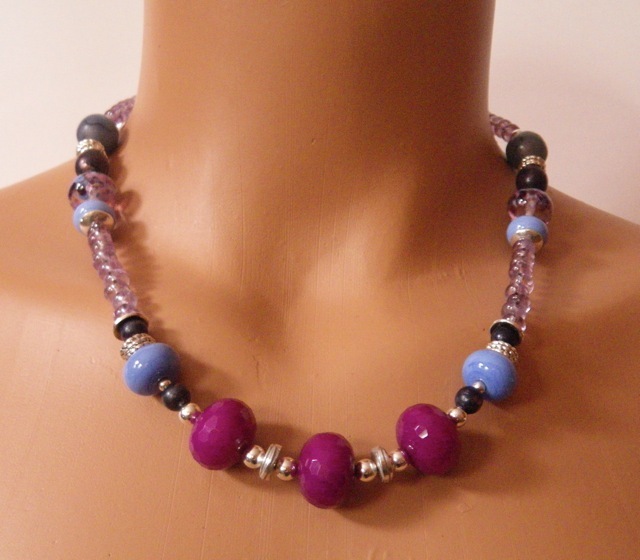 The purple and periwinkle necklace is so sweet – love those happy colors and it looks to be the perfect length for wearing with lots of different outfits. 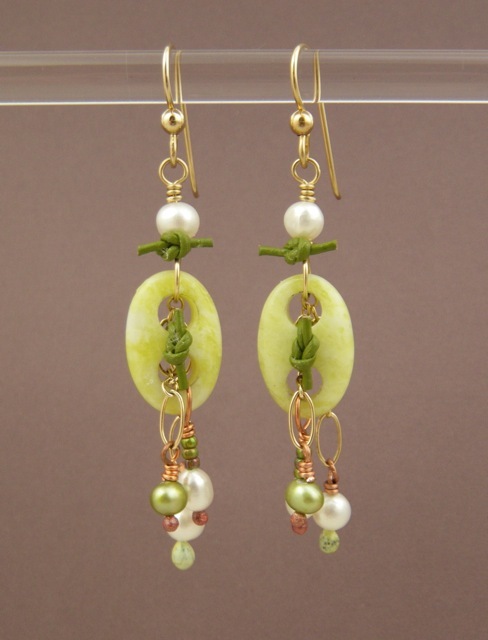 Your earrings are so sweet and clever – love how you approached those two-hole beads – the green plays with that yellow perfectly, and I love how you added the swinging dangles to Lori’s periwinkle beads – what a fun combo! 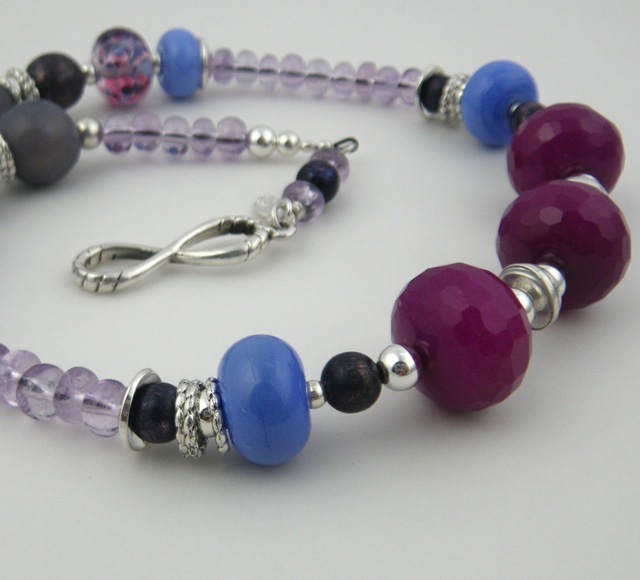 And the bracelet – that color combo is scrumptious – not only that, it is lovely AND easy to wear! Your pieces are all wonderful. I really like your elastic bracelet with the silver shells, too. So cute. But that brooch is awesome. I’ve been wanting to try some brooches and you’ve really inspired me. Love all the different techniques and textures you used in the brooch. Ohh my, LOVE that brooch. It is adorable! 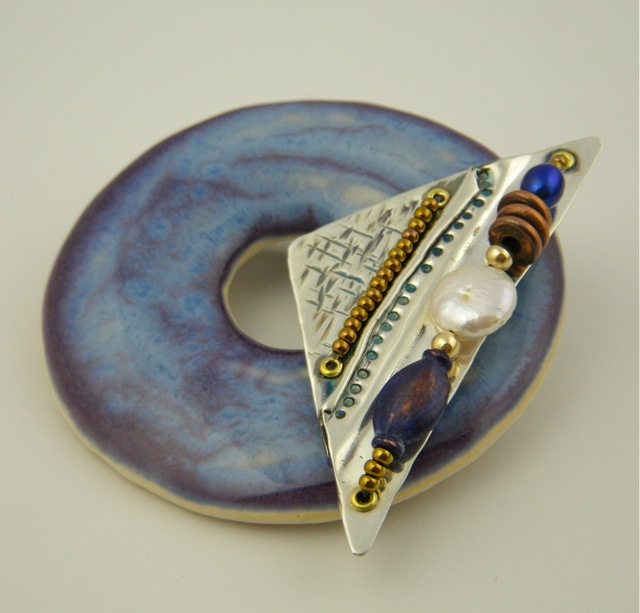 Oh my Barbara what amazing pieces …You are so darn creative. 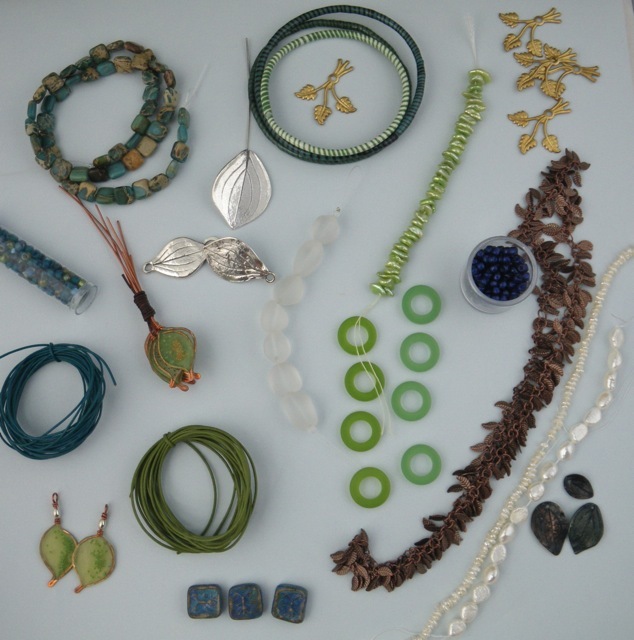 I love all your pieces….Especially the little jade earrings. Green is my fav. color. ty so much for sharing with us all…I was in first reveal but have been enjoying viewing all the reveals. bye for now and Happy beading…..
Wow! I am impressed that you can come up with so many beautiful creations and they all exude very different feel. 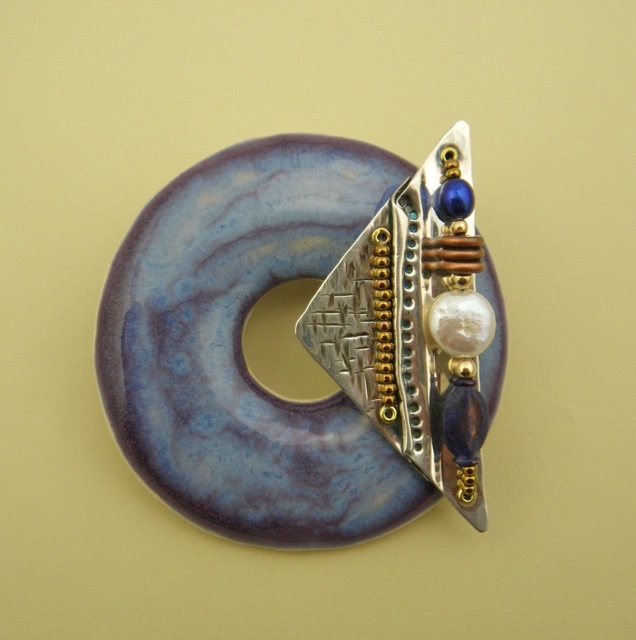 I would never have thought to make a brooch with the focal and you did it in such a creative way. The earrings are lovely too, especially the ones with the green button beads. Love those earrings. I would wear the bracelet all the time too. What a lovely cooking, Barbara! The brooch is beautiful! Like the story behind the piece, what has resulted in the fished design ;0) The most beautiful art pieces always are a result of unforeseen hazards! Also your other creations are very charming – very well done, my dear! I love your brooch and the necklace is just gorgeous and the earrings are to die for but I am with you, I just love that elastic bracelet. You did such a great job showcasing those glorious beads. What a fantastic brooch, you are really brave drilling you focal, but it is truly inspired. Love the little yellow earrings. What fun! You did a fabulous job with all of the soup! I am partial to green so the earrings really caught my eye. I love your work in general! Beautiful job with your soup! Your pieces are all lovely…especially the brooch! You’ve made some lovely pieces there – It’s hard to choose a favourite! Great! Your are so creative! The green Jade earrings are my favorite! I am awestruck with your brooch. Oh the colors. You do such great metal clay work. I am just starting. A little scared and shy with the torch. Thanks for dropping by my blog. Will visit you again. Dita. Love love love the earrings and what a creative brooch! Great job! I love the brooch! I love all that you created – great eye for color! You mastered your soup mix!!! I love your designs especially the earrings. Love the brooch and your fold forming triangle. 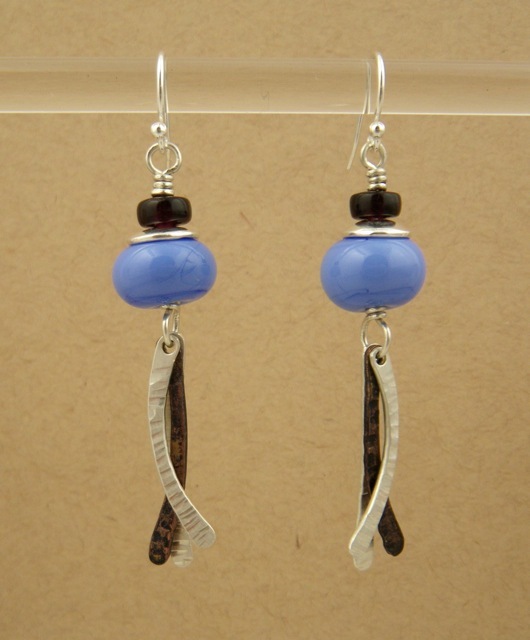 Love the periwinkle earrings too as I am partial to metal work. All your pieces are beautiful! I love what you did with your soup. The brooch is inspired – I’m taking tentative first steps into metal work so it was inspiring to see what you did. 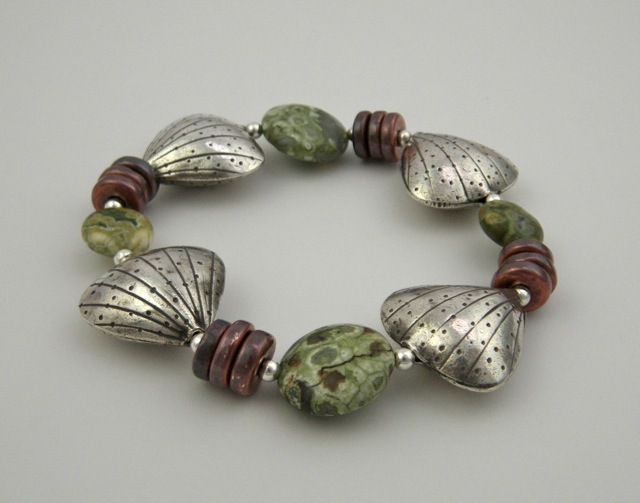 I especially love the bracelet with the silver shells. Reminds me of “mary, mary quite contrary”. How do I leave a comment on a reveal that has left me speechless!? Let me TRY to express my thoughts. Second, your designs are simply amazing. That brooch was inspired! I love the way it has both a modern and rustic feel to it at the same time from the metal and ceramic combination. So lovely! Your necklace, earrings, and bracelet are all also so awesome. I could sit and admire them for some time. How great that you were paired with Lori and treated her soup with such skilled fingers and a talented eye. Wonderful job!! Wow, thanks Hope! That’s quite a nice review! Fantastic pieces, Barb! That brooch is just exceptional, and I love your elastic bracelet also. You’re a brave soul, drilling through that pendant! I’m still hopping :-) and wow, you made some amazing jewellery… very chic and fashionable! The green & silver bracelet, such a dream! And the earrings too! Have a nice Sunday. Thanks Dini! I need to finish hopping, myself. Your nice comment is a great reminder.